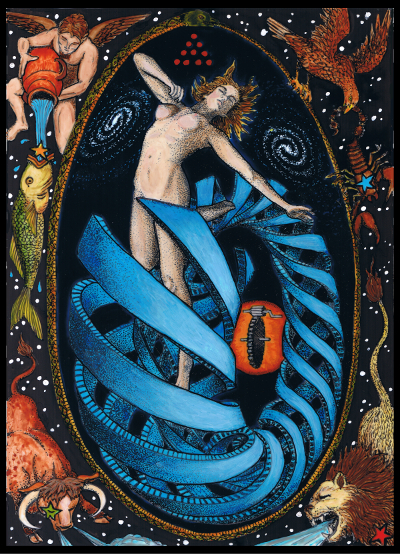 Note: Pharos Tarot has been given it’s very own page, with a link at the header of the website. Future posts on the deck will be consolidated there as the cards are revealed. Please check there, for new expanded information on the Hanged Man, and on this deck in general. And now back to the original post. This is a new tarot journey. A voyage even. This is the beginning for a tarot called Pharos. I thought it should start by showing a Mother letter, as after all everything comes from them. Since this is a journey of water, I thought the Hanged Man is a good place to start. I call this card The Sea, where it begins. 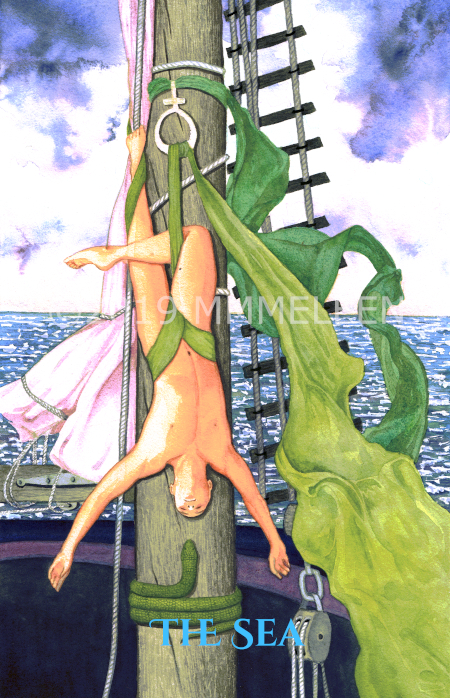 The Hanged Man is Mem, one of the three Mother letters, corresponding to water. Pharos Tarot is a watercolor deck, and watercolor is all about the interplay of water, pigment, and light. One could say even that as a medium it best describes the elemental journey. It certainly involves water, and fire (light) but also air as it dries and earth in the form of pigment. This deck is about my exploration of the medium of watercolor. It felt like the medium that would be best for this deck, as it is also an exploration of color, and watercolors are known for their luminous quality as light plays through their transparency. Watercolor is a medium I’ve never used much before, so it is very new to me and it is extremely challenging. I wanted an artistic challenge. But that means making a lot of mistakes. I have a lot of cards done, almost all the Majors, but several of them are going to be redone, as along the way the seas have been rough. I’m learning to ride the waves. Garlic and Arts Festival Aftermath: buy a print get one free! Fascinating! Set your art free. I was literally thinking about your latest deck last night and wondering when you might update us on your progress and here it is today. It’s breathtakingly beautiful. Mel, this is beautiful! Keep us posted! I certainly can’t tell it’s a new medium for you from this. It’s beautiful. Also love Pharos for the title and the gorgeous use of GD color scales. Exciting to see the start of this new journey! The interweaving of light and color shimmer through the extraordinarily original interweaving of symbolic forms. “The Sea” is an image I can look at again and again. It entrances eye & psyche. OMG I’m so excited! That is gorgeous! Can’t wait to see them all! “A journey of the water”, I’m a Marine biologist lol, loved it! May the Pharos light shine brightly. Really looking foward to seeing each card come to life with this style! Stellar work.